These lucky visitors to the park had their cameras on hand to capture the jaw-dropping moments! It's no secret that there are adventures to be had at the Kruger National Park for thrill-seekers and animal lovers. These lucky visitors to the park had their cameras on hand to capture the epic moments! Here are some of the wildest videos. The cameraman's mother's reaction is one for the books! This elephant decided show these visitors who rules the park. These hot hyenas decided to take matters into their own paws during a Kruger heatwave -- and they had a whopping good time too! The Kruger can be harsh -- how's a lady to take care of her skin? Why, a cowpat face mask, of course. This little guy's adorable party trick is guaranteed to brighten your day. This rare close-up encounter between a male lion and safari tracker will send chills down your spine. 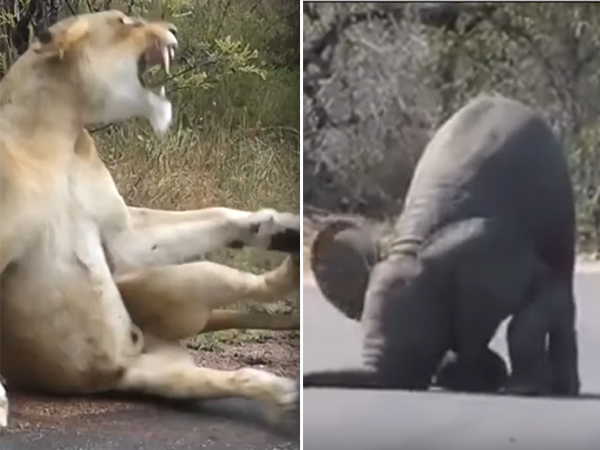 This rare sighting shows the pretty gruesome moment a lion pulled a Buffalo fetus from his kill at Mazithi Dam, north of the Tshokwane Picnic Spot.